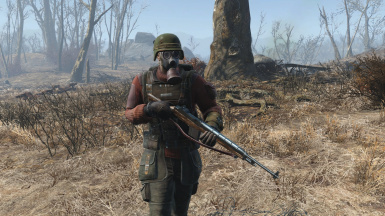 A new vintage rifle arrives in the Wasteland, with a huge amount of customization! The meshes and textures of this mod were masterfully created by Nexus user moniterman. You must gain his express permission to use any parts of these for any purpose. 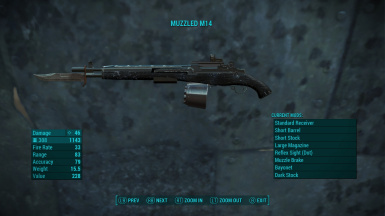 The rest of the mod was created by me (FF7CloudStrife) again you must gain my express permission to use any parts of these for any purpose. My eternal gratitude to moniterman, without whom this mod would not exist! He's back folks! 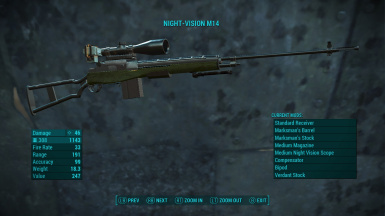 Not content with simply delivering unto us the excellent M9 Model, moniterman has outdone himself this time; I'm sure we can all agree that his M14 model is an absolute stunner! 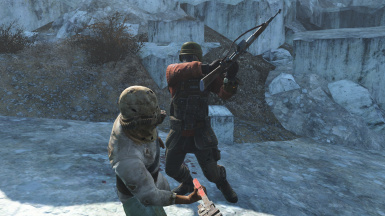 Once again he graciously allowed me to break out the (virtual) hacksaw as well as providing me with a selection of Barrel and Scope models to really give the mod some extra variety. Not to mention the excellent original textures too! Before you get on to downloading this, please head on over to moniterman's profile and give some Kudos or send a message to show your gratitude. Once again he has gone above and beyond to give us another fantastic model. Like always it's members like him that really make the Nexus community and modding in general a great place. 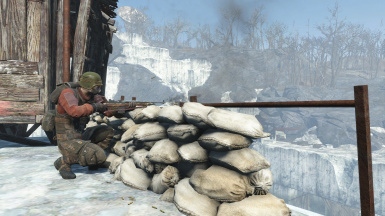 This unique firearm gives a glimpse of what could have been the future of war but with a heritage tracing back to the Second Great World Conflict. General Adam 'Reno' Anderson was a prolific weapons designer and his 'Model 1 Battle Rifle' (M01) would become an iconic weapon of the U.S. Military. The designers stamping on that weapon (G.A.R.ANDERSON) would give rise to the popular 'Garanders' moniker for the weapon and it's operators. Even before the cessation of conflict Anders's began designing the sequel to his popular original. By the fourth iteration (IT4) the gun had become far more powerful, accurate and capable of automatic fire as well as there being the inclusion of a detachable magazine. The rapid development was halted however with the capitulation of Japan, ending the Great Conflict and the ushering in an era of world peace. 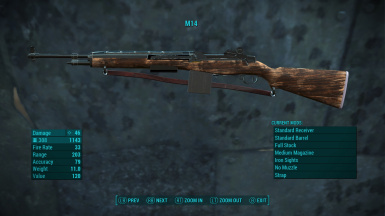 The M14 was intended to see use in what would have been called 'The Pacific' but this conflict would never materialize. Unfortunately confined to the footnotes of history, had the rifle ever seen action it would have surely become as famous as it would be feared. By request of the collector the weapons on display all remain live and operational. Any attempt to tamper with or damage the display cases will be considered a federal offense. Often requested and finally available! 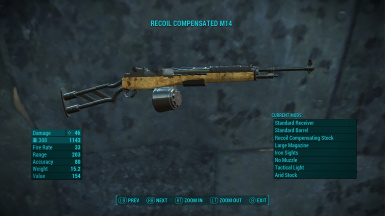 This iconic gun should be a real joy to use in the Wasteland. The mod itself comes packed with features so I'll try and keep it brief! 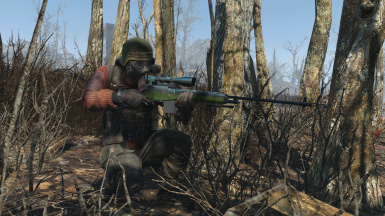 As well as the fully custom model and textures there are custom sounds, spawn list integration, texture swaps, ammo types, a new accessories category and of course, a huge amount of mods! To elucidate on a couple of the above, there are 3 new modding categories at a workbench giving you new possibilities for personalisation. 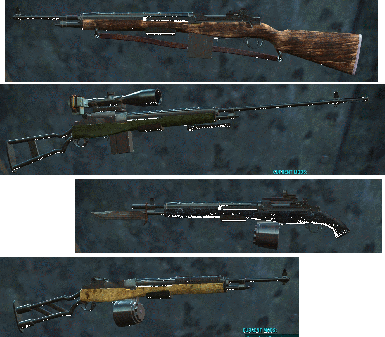 The first of these is the new Accesories slot, so far I have created a Strap, Torch, Bayonet and Bipod to select in addition to all the standard mods. 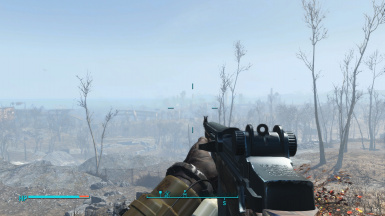 Secondly is the Material slot, allowing you to easily alter the base material of the gun. 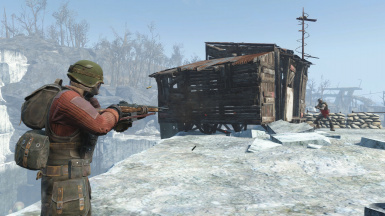 Finally there is the Ammunition slot which allows you to select specialty ammo's for your weapon. This has been a few weeks in the making and does incorporate some experimental ideas, any constructive feedback is appreciated and my apologies for any unforeseen glitches! undyne777 for tireless help and advice. beaverdog for consistent enthusiastic assistance.